Taste test: These are thick and crunchy, sort of kettle-style chips with tons and tons of great parmesan and garlic flavor. 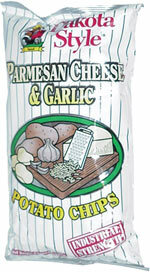 These were a huge hit around the chip bowl  probably the best parmesan and garlic chip we've ever tried. Smell test: Very mild garlic aroma. Nice.